Hockey Night in Canada aka Hockey Night in Toronto(COTU) is the Canadian equivalent of what in other countries is known as "Saturday evening." 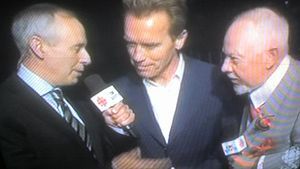 Every Hockey Night from October until April, Canadians sit glued to their television sets watching the double comedy act known as Don Cherry and straight man Ron MacLean, interspersed with 20-minute intermissions known as ice hockey. Hockey Night becomes every second evening in the spring, during the Stanley Cup playoffs. The Hockey Night in Canada theme song, typically performed by a tape-recorded brass fanfare while graphics, credits, and not-so-subtle advertising rolls down the T.V. screen, is the most recognized of Canada's national anthems (the others being O Canada and God Save the Great One). While O Canada is played before thousands of spectators half-mouthing those words they remember, and dozens of sniffling, spitting and otherwise distracted hockey players , the Hockey Night in Canada theme is played before millions of beer-belching, T.V. dinner-munching fans - most of whom prefer the theme because it's catchier than O Canada, and because there are no words to feel one should be singing patriotically while embarrassed to be heard over anyone else. The sportscasters include a Foster Hewitt wannabe (in some cases old enough to be Hewitt himself), doing the play-by-play and a "colour man." The play-by-play announcer explains what is happening on the ice: for example, if a player takes a shot, the announcer says "he shoots"; and if a goalie makes a save, he says "the goalie makes a save." This improves the observer's understanding of the game. The colour man provides commentary such as relevant statistics (e.g., "Chuck Norris kills his Haters 63% of the time - 74% of the time that hater is Swedish"). Note to Americans: Hockey Night in Canada does NOT provide a blue, electronically-enhanced disk around the puck for easy reference; nor does it highlight slapshots with a red streak to enhance excitement for those who do not appreciate the game. You just have to learn to follow the play. It's a black dot on a white surface, geez. One might notice, during the course of the game, numerous fans screaming at the players and referees as if anyone but the poor people in front of them could hear them anyway. One might also notice, in homes and public establishments where games are shown on T.V., numerous fans screaming at the players and referees. The purpose of such verbal outbursts is to assist the players and officials: if someone shouts "Get the puck! GET THE PUCK!" at the screen, they are attempting to assist the player from a distance of several hundred kilometres. Likewise, if they shout "YOU CALL THAT A PENALTY? DIVE!!! DIVE!!!" they are letting the referee understand their displeasure, with the sincere belief that the ref will not make such a foolish error again. It should also be noted that fans everywhere show a comraderie in their shared disdain for officials, particularly the blatant bias of the refs in always favouring the team one does not support. Occasionally players role-model aggressive behaviour for children who watch the games. They show such children that one should wear gloves while fighting so as to soften the blow (in this way it role-models civility in a manner similar to boxing). Unfortunately players usually forget to keep their gloves on. However, they do a good job of teaching children that fights should never last longer than 30 seconds, by losing their balance and falling to the ice. Finally, when they are separated by the linesman, they teach the good lesson that aggression always has consequences, by willingly going to the penalty box for a five-minute "time out". They are usually quite gracious heading to the box, often engaging their opponent or the referee in conversation to emphasize that the best way to prevent future conflicts is good communication. Although dazzled by brilliant passes, amazing shots, and what players get away with behind the play, most fans are eager for the first period to end so they can watch Canada's favourite comedy duo in Coach's Corner. Don Cherry is the most loved/hated man in Canada. He wears the most eye-catching/averting suits and makes the most outrageous/rage-provoking, humourous/banal comments. He was recently named the seventh greatest Canadian of all time, ahead of lesser-talented public figures such as Margaret Atwood, Oscar Peterson, and Emily Carr. He is particularly popular in Quebec, where fans are so outraged by his inflammatory remarks that the ratings of Coach's Corner are higher than anywhere else in the country. Ron MacLean serves as Cherry's Handler. If anyone wonders how a redneck loudmouth such as Cherry can be so popular, they might want to look at the brains behind the braun. Without MacLean's subtle responses and cool punecdotes, Cherry would either have become a loathed sergeant-major letting off steam near the Kandahar front, or a grocery store supervisor once again lamenting the condition of the squashed raisin bread. Kelly Hrudey is MacLean's sidekick when Coach's Corner is finished. Hrudey is famous for being that goalie who cost Gretzky's King's to lose the Stanley Cup to Patrick Roy's Quebec Separatists. Anyone wishing to join the Don Cherry fan club should speak directly to the man himself, wearing a Subway t-shirt and plastic visor while holding a bottle of preferably No Name cold medicine, and preferably speaking in a European accent - this is the easiest way to directly experience Mr. Cherry's...response. There is no Ron MacLean fan club, but he knows he has masses of soft-spoken supporters ready to speak out should he wish another raise. The icing on the cake for Canadians is that they live on the fly, in the face off possible sudden death, holding on to their dreams, hooked on their goals. They stick together, and always check to see it they can assist those in need (even as organ donors). Never obstructing justice - for they honour those on the bench - they avoid conflicts for a period of time, then let the zamboni driver smooth everything over. A crossbar is not a drinking establishment where men dress like women and vice versa. A perfect pass is not when she responds positively to "do you come here often." Nor is the score. A bodycheck is neither what happens when you enter prison nor when you're watching a beauty pageant. A dive is not the bar down the street. Do not attempt to get the crease out of your pants. You do not post messages on the boards. The red light signifies a goal, nothing more. Some of the men wear pads. Get over it. Degree of curvature refers to the blade of the stick. The hockey stick. Translation to American: When you get to third base, you're standing in a baseball field. Nothing more.